Mary Ann Rivers burst onto the contemporary romance scene last summer with the beautiful novella The Story Guy. Her follow-up title was another novella, Snowfall, in Loveswept’s Christmas anthology. Both sure-footed debuts had premises that might have come off as gimmicky with a lesser talent. In The Story Guy, the couple meets through a quirky Internet solicitation and in Snowfall the hook is anonymous connection via a photography website. But Rivers’s thoroughly realized storylines defy predictability with satisfying results. 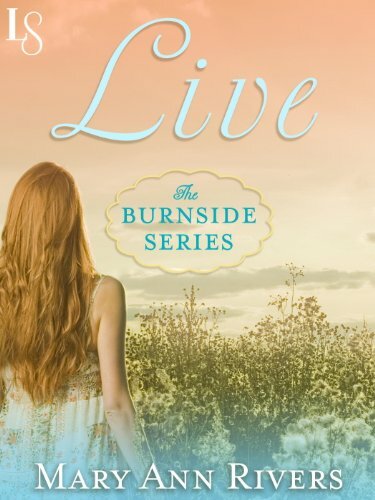 Now the author is back with Live, the first in the Burnside series of full-length novels. And for the third time, Rivers demonstrates that her real strength is not in clever premises but in unusually—for a contemporary romance—literary prose. Ms. Rivers is actively staking new, lyrical ground in a genre often sidelined as a guilty pleasure. There’s no need to choose between heat and good writing. From this author, readers get a two-for-one deal. In the pages of Live, as with her other work, readers can take equal pleasure in both the steamy love scenes and in poetic, insightful passages exploring the human condition. The premise for Live is simpler than those of her novellas. Unemployed Destiny Burnside and underemployed wood carver Heflin Thomas meet cute in the public library after Destiny bursts into tears after reading her three millionth job rejection. But the two have been watching each other for a while now. And in spite of Destiny’s demanding family responsibilities and Heflin’s grief over a failed marriage, they manage to ignite a passionate romance over pancakes and serious conversation. Their blossoming love is doomed to fail, however, since Heflin must soon return to Wales. Their anguish unfolds through snappy dialogue and beautiful imagery. He must go, and she must stay. And in the meantime, the fictional town of Lakeview, Ohio becomes a quirky, lovable character in its own right. Destiny’s history and entanglements there effectively become the third lover in a trope-busting love triangle. In her quiet way, author Rivers bucks every trend in contemporary romance. Her heroes are not tatted up bad boys. Her men are strengthened by their choices and their quirky hobbies, not by the ink on their bulging forearms. One common flaw of contemporary romance plots is the way the hero and heroine often seem to live inside a bubble, the real world receding for a couple hundred pages while the couple works through their own internal anguish. In Live, as in her other work, Rivers allows the real world in all its gritty detail to do the work of keeping her hero and heroine apart. Since the author is a nurse, medical story lines intrude. But in Rivers’s ICU, the drama doesn’t come from flat-lining monitors and daring medical intervention, but rather from the smell of disinfectant and the anguish of putting one’s life on hold while harried people in scrubs run by, too busy let you in on your own fate. Live smolders at a refreshingly slow burn, but it is no less hot for that. Since the novel’s conflicts are built from issues that are all too concrete, there isn’t any place for device or gimmick. Instead, there is only reality in all its thorny glory. Live blooms with the freshness of thoughtful storytelling carefully tended by beautiful prose.